This is a unique show. A fine example of physical comedic theatre with a Shakespearean core and a 16-bit coating. 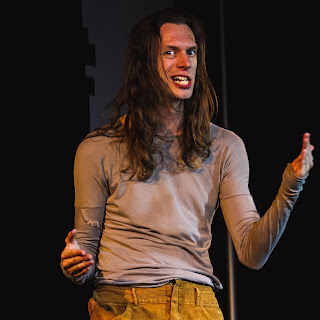 Writer and performer has combed computer gaming history to pack in as many references as he can without losing the original Shakespeare plot. It is a clever comedy that works really well. It is a shame it is only in Newcastle for one more night. It was clear at the start that a number in the audience were regular gamers. 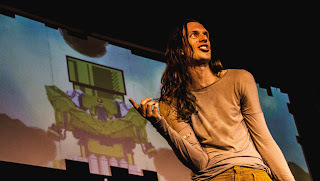 The crowd understood the Portal references on the projection but they also remember the fun of playing Mario Kart on the Wii. This element of the audience had a part to play in a show that occasionally broke the fourth wall. 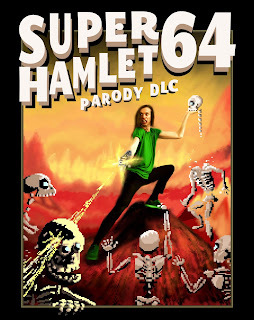 Now, Hamlet reboots are nothing new. Disney have enjoyed success with The Lion King which copied much of the story. But whereas Disney used cute animals, Edward Day uses familiar characters from gaming. Hamlet’s Dad is Mario, his uncle is Luigi. In the love triangle is Peach, who marries Luigi with indecent haste after his brother’s death. This leaves Edward’s character the “simple” job of killing the uncle. The single-handed play is accompanied by a large rear projection and 2 smaller screens that, on occasion, show the players stats. What adds to the unique show is when Edward appears in 16-bit form on the gaming sequences. Anyone who has seen the title sequence of Dara O Briain's Go 8 Bit on Dave will understand the concept. That said, the show is more than an homage to gaming. Writer and performer Edward Day has a wealth of experience with performing Shakespeare and he has got under the skin of text. I have said in previous reviews that if Bill was alive today, I’d imagine he’d be more into this type of relevant theatre than the stuffy verbatim retellings of his original script. I’ll avoid a spoiler alert here, but the heartbreak ending of Hamlet really lends itself to the Undertale treatment. The production felt bigger than the sum of its parts, partly down to the well thought-through interaction between the screen and the performer. Whether this be the inclusion of the monologue in text or the appearance / disappearance of the character through a portal, it was a slick performance. I had pulled my gaming teenage son away from his X-Box this evening to come along and to offer his thoughts. He said it was the best Shakespeare he had seen and yes, it was better than a night on his console. I don’t think the show can have a higher recommendation than that! I am really pleased I had the chance to see this show. Now I need to get my PS3 controllers back on charge.